Make a slaw with remaining cabbage. We will post a recipe for our version du jour soon. Melt butter in small saucepan over medium heat. Add onions and cook until just soft and translucent, a minute or two. Combine beef, rice and eggs in a mixing bowl. Add onions and season with a heaping 1 teaspoon sea salt, pepper and thyme. Add currants. Mix well (clean hands work well) so that everything is nicely combined. Cover and refrigerate until needed. Whisk together tomato sauce, brown sugar and vinegar. Season with a pinch more salt and set aside. 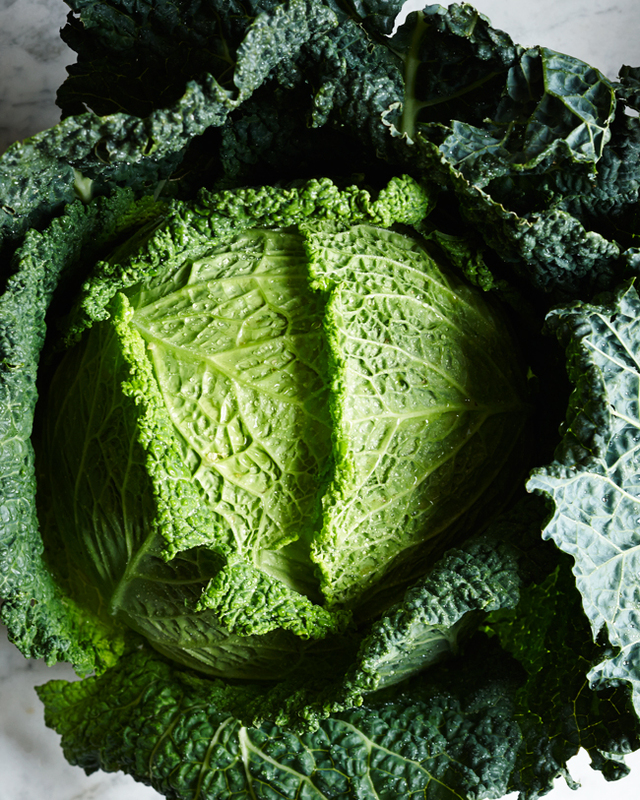 Carefully peel back outer leaves of cabbage, using a sharp knife to cut leaves from stem. Cut out thick part of spine, creating a narrow long V in each leaf. You will need about 12 leaves. If leaves tear they can be patched with smaller interior leaves. It is a good idea to prepare a few extra leaves for this purpose. Fill a large pot with water and bring to a boil. Fill a large bowl with ice water and set next to stove. Salt boiling water. Working one leaf at a time, blanch until tender, about 30 seconds, remove from boiling water and submerge in ice water. Add more ice to water as needed. When all leaves are blanched and chilled, drain and pat dry with paper towel. Heat oven to 350. Use about 1/3 cup of meat mixture for each leaf. Shape meat into a rectangular shaped patty about as thick as an average bar of soap. Place patty right above deep V and fold up one side and then the other. Then fold, tuck and roll remaining leaf to fully enclose meat and place roll in a large baking dish - flap side down. Adjust rolling technique as you will - the point is to create a neat, tight package with no meat exposed. Pour tomato sauce over cabbage rolls. Cover baking dish with tin foil and place in oven. Bake about 50 minutes. The meat should be cooked through and the tomato sauce hot and bubbly. Serve immediately with a spoonful of sour cream and/or hot mustard.